You dance close together so nothing is as annoying as body odor and bad breath. A fresh shower beforehand and teeth brushing are a must. Avoid garlic and alcohol. Use (not too much) deodorant, aftershave, perfume. Do not wear loose, swirling round or sharp attributes (belt, chain, ring). At many festivals and (salsa) parties you get after paying an entrance a stamp on your hand. Ask as man that they put it on your left wrist, so you avoid making an impression with your right wrist with wet ink on the back of your lady. Especially important if the lady has a light or white blouse. Usually, the man asks the lady to dance, but of course this can also be reversed. If someone asks you to dance you do not refuse. Unless it’s a particular dance you cannot, or witch is already have promised to someone else. But then you do that too. It is then appropriate to propose to do a next dance together. If you promise to dance with someone you do too. Do not be pushy if you want to dance with someone. Stay polite. Don’t monopolize anyone. Give everyone a chance to dance with everyone. 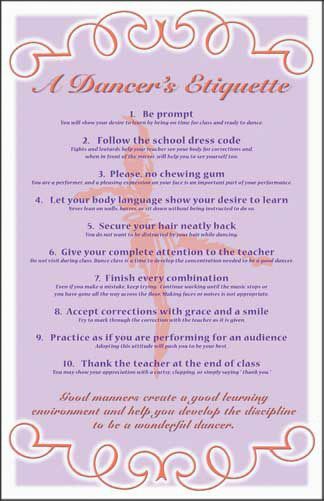 Also ask beginners to dance, and adjust yours. Wouldn’t you like that yourself? Accompany your partner to the dance floor. After the dance, you do not just go off the dance floor. You might want to have a dance partner to do another dance with you. If you decide not to dance you must also accompany your partner back. Thank your partner for the dance. A very nice tip: every dancer would certainly invite one wallflower! Avoid collisions. Watch out. Send and warn your partner. Adapt with r.g. a less comprehensive framework, smaller steps, another move or just quit. If you do collide, then complete apology. Do not dwell on the dance floor to think, discuss or chat. That can also next to the dance floor. The dance direction to counter clockwise. The outer ring is faster than the inner ring. Advanced dancers swerve out for beginners. They have a more options, moves, knowledge and experience. 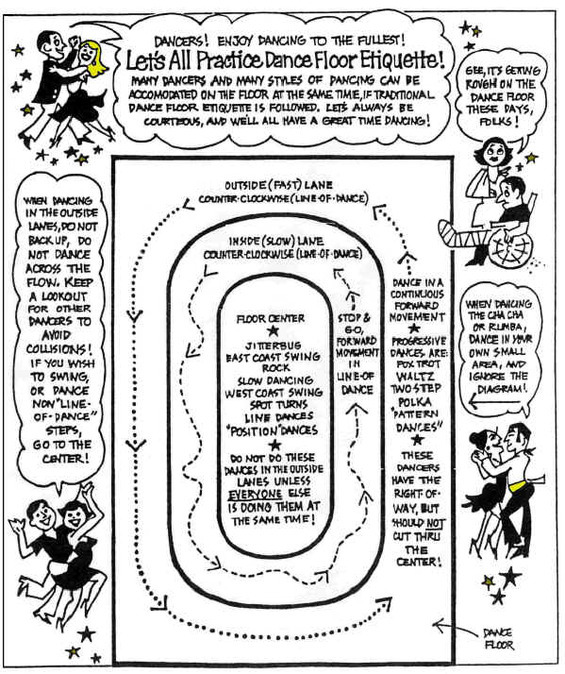 Allow other dancers some space on the dance floor. Dance smaller on a crowded floor. Do not be angry with your partner (s)he makes a mistake. Do not give (unsolicited) dance lessons. You do not have to apologize for any mistake. It is possible that your partner even not noticed. You dance especialy for fun, so no fighting, keep smiling! Some people are polite, others are honest.